This is the SAPUI5 documentation version for SAP NetWeaver Application Server for ABAP and the User Interface Add-On for SAP NetWeaver. For an overview of all available versions of the documentation, see Available Documentation. Apps developed with SAPUI5 present one consistent user experience. SAPUI5 comes with many feature-rich UI controls for handling complex UI patterns and predefined layouts for typical use cases. Apps built with SAPUI5 are responsive across browsers and devices - they run on smartphones, tablets, and desktops. The UI controls automatically adapt themselves to the capabilities of each device. Tip OpenUI5, an open source version of the UI development toolkit for HTML5, is available at http://openui5.org/ . Servers come into play for deploying your applications, storing the SAPUI5 libraries, and connecting to a database. Depending on the environment in which you are using SAPUI5, the libraries and your applications are stored for instance on an SAP NetWeaver Application Server or an SAP HANA Cloud Platform. 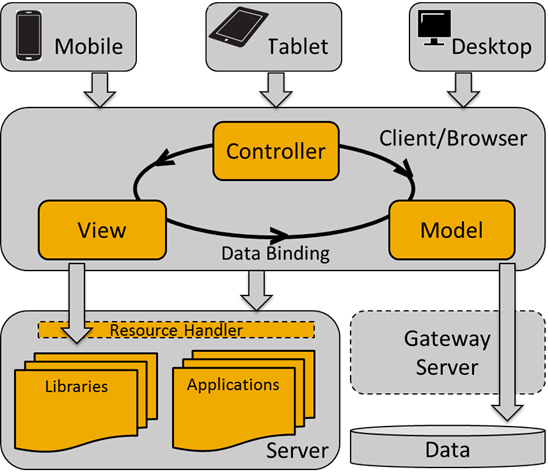 The preferred way to access business data for your application is by using the OData model through an SAP Gateway.